Over the changing of the season, many problems can occur to your house. Extreme heat, low temperature, and humidity can do damage to several parts of the building. Maybe, one of the most disturbing ones is the mold on ceiling. Not only it destructs the construction materials in long-term, but it also harms your family’s health. As a living microorganism, a mold is a form of fungi that grows, eats, and reproduces. Unfortunately, to reproduce, it releases spores which can be harmful if it’s inhaled to the human’s body system. It can cause problems like headaches, nausea, lung irritation, eye irritation, and allergic reaction—mostly because the spores would try to grow just anywhere it lands including the human body. 1. What Exactly Causes Mold? To speak fact, mold spores are everywhere, even in the air we breathe. However, it would not grow unless it lands on the perfect medium and gets the right environment. In nature setting, the mold is present to help recycle decaying trees and plants. The biggest size of the spores is around 40 microns, which means it is smaller than the diameter of one strand of hair. That makes spores are impossible to see with bare eyes. While it may be beneficial to nature, it would create the same destructing and recycling effect when it grows on your house. First, most houses have woods as its ceiling and wall construction, which would be an ideal medium for the mold to grow. The condition might be worse if it has insulation system. Secondly, mold grows in a humid environment. 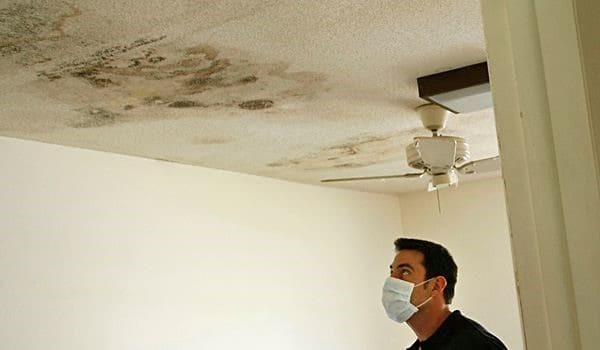 Therefore, if your house has a poor ventilation system, experience condensation due to the weather, or has had a problem with leaking recently, there is a high possibility of mold growing in the dark, damp corners. Mold on ceiling, bathroom, and basement are some of the common problem in houses. Some mold grows on obvious part of the ceiling, but some others may be found in hidden areas. The mold usually creates brown and black spots and may form some pattern around the ceiling. Mold on bathroom ceiling can happen, too, especially if you don’t have enough air circulation in it. 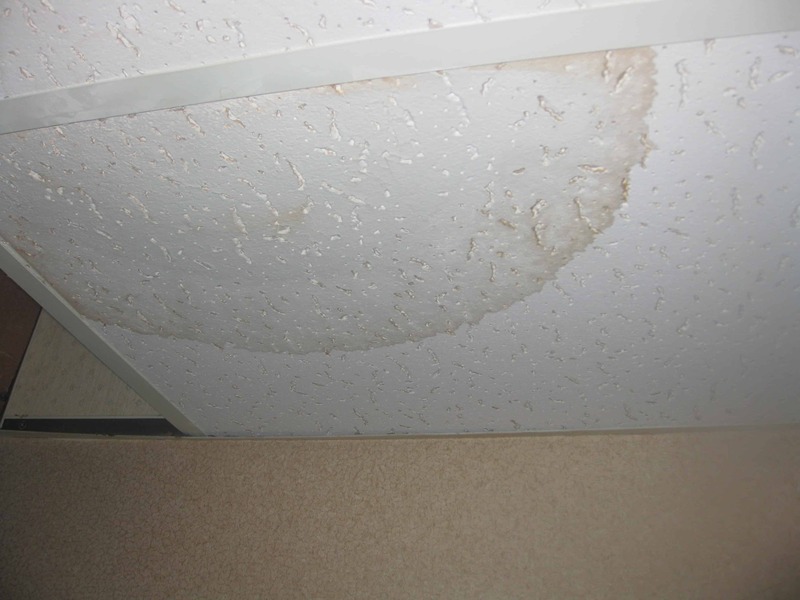 Water damage and leaking create brown circular discoloration patterns on the ceiling. If there is water damage present, the possibility of mold growth is high. Look further on the loft or insulation system if the mold cannot be easily found on the ceiling’s surface. Black, brown, and grey spots may not only be caused by mold. 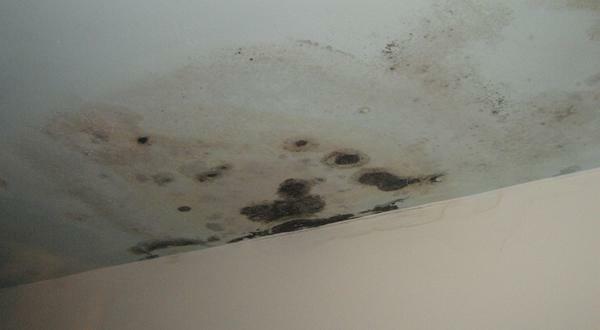 There are two types of mold on ceiling, the active and the inactive molds. The active mold would smear if you touch it with hands and feels slimy, while the inactive ones would rub off because it is dry. If you have been in contact with any fungi, mildew, or mold before, you can sense a different smell. It is a combination of wet and rotten wood smell which is mostly musty and strong. Though mold can grow on wall and sheetrock, wood and other organic materials are their favorite medium to live. If you see that the woods on the roof are starting to rot, or the surface may be curled up, it would be one of the signs of mold presence. Mold on ceiling can go undetected for a long time until you realize it creates serious trouble for your house. Here are some of the ways that you can try to treat it. As mentioned before, mold or mildew on ceiling grows on a dark and humid area. If the black spots are present on the visible part of the ceiling, the root of the problem may start from behind it. You need to check the ceiling and create the inappropriate environment for the mold. Give the area enough sunlight or bright heat to inactivate the mold. Once the colonies died, it would be easier to clean, and there should be less possibility for the mold to grow back. Cleaning the affected area involves using mold cleaner that is made from chemicals. However, you can use household items such as vinegar, hydrogen peroxide, bleach, and baking soda. Spraying the affected area with one of those solutions would kill the microorganism and prevent it from growing back. On the surface of the area, the paint should be scraped off before you paint it. Directly covering the black mold on ceiling is not recommended as the trace of the mold pattern would still be visible. For the ceiling material that is hard to clean like drywall, you may want to consider another way: remediation. It is a process of removing the ceiling and replacing it with the new one. Though remediation is more expensive than ceiling treatment, it offers a simpler way. In some cases, remediation is the only option because the damage caused by the mold is too heavy. Also, it also assures that the mold is completely terminated. If you decide to treat the mold by yourself, remember to wear full protection when doing the job. Mold spores can fly everywhere and affect your body. It is also recommended to open all ventilation when cleaning the mold on ceiling so that the spores would possibly float out of the house instead of landing on somewhere else inside. In conclusion, removing mold on ceiling and other parts of the house can be done independently. The key is to protect yourself and the house from mold spores that are looking for a new place to grow. However, you can always call mold termination experts to do the job especially when the affected area is large or hard to handle.